Drivetrain vibration - not the pinion angle - SOLVED! I bought me a 88 YJ with 4.2 & BA 10/5 & NP231 a year ago. Everything works great except from drivetrain vibration. With the old engine/transmission/transfer case it was absolutely fine. It has new Crown heavy duty leaf springs and greasable shackles that "lifts" only 3/4 inch. I thought it might be the angle at the rearend of the TC, because I had to modify the transmission mounting plate to make it work with the AX15. I have now modified the skidplate to lower the transmission and TC a tad. And put in some 2 degree shim at the rear springs to correct the pinion angle. 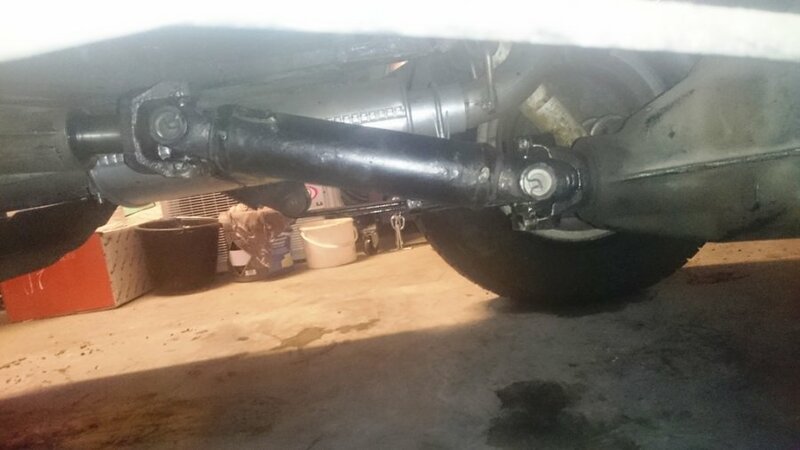 At the same time changed the U-joint in the driveaxle and the bushing at the rearend of the transfer case. My transmission and engine mounts are new. It isnt shaking and both me and the Jeep will probably survive the vibrations, but it WAS better before the swap and that annoys me! post up a pic of your rear drive shaft and pinion angle from the sides. First, make sure the driveline is 'in phase'. Everyone seems to forget that the yokes can cause wobbles when out-of-phase. Assuming that's good, and you have the two ends (T-case/pinion) within, say 1 degree of parallel, you'll want the slope of the shaft so you can figure each end's operating angle. About a 3 degree angle (that's 3 up and 3 down or about 6 total) seems to be the higher limit according to Spicer. I gave up on doing that without an SYE. Good Luck. Its difficult to take a picture right from the side, so it probably will look odd, even though its correct. TC angle is now 5.5 degree and pinion angle is 5 degree. I believe both engine and transmission mounts are rubber, and they where replaced before I did the swap. You cant get the yokes out of phase when the driveshaft is one piece without splines? I havent measured the angle of the driveshaft, but its just lifted 0.75 inch (with 1.5 inch longer shacles) and it didnt vibrate even without the 2 degree shim before I did the engine/transmission swap? Have you have the drive shaft checked to see if it is balanced? 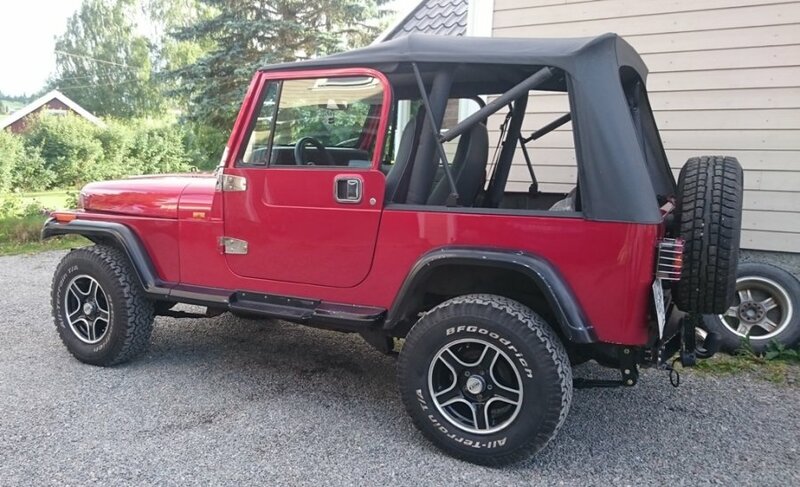 93 YJ SOA 2" springs front, XJ springs rear w/main leaf added, High pinon 9 inch rear detroit locker front Dana 44 ARB 4.56 Gears, 36 inch Irok tires too much to list. Did the transmission mount end up having 2 bolts through the skid plate or 4? Does the trans mount on your jeep have the torque arm assembly intact and in use? At less than 1 inch of lift - as you asserted - there should really be no need to adjust the pinion angles and such. My guess is you have either underrepresented the amount of lift or you've got a missing torque arm asy that is allowing the trans mount to tear itself apart under too great a strain and the trans assy is vibrating not the shaft. Maybe there are some technical phrases I dont understand, but the splines are at the TC end "before" the yoke, not at the axle it self. No, I hadnt any vibrations before the swap, and reused the same drive shaft. I actually used the same transmission mount and mounted it the same way as it was on the Peugeot trans. Just two bolts through the skidplate and two bolts in the transmission casing. Torque arm is intact and in use. The 3/4" lift was there before the engine/trans swap and is not the reason. As mentioned the transmission is mounted to the skidplate in the same manner as before, using the same (new) transmission mount and torque arm. But I think you are right, that the vibrating may comes from the transmission/TC and not the axle. You stated it has vibes now both "accelerating AND decelerating" is this only with it in gear on decel? What happens if you are up to speed and take it out of gear to coast? Still have vibes? Actually it is a slip yoke. Slip yoke eliminators move the slip part to the driveshaft, making it a slip shaft. No it is only when in gears. It vibrates both when acceleration and deceleration but not in between - when I just "cruise along" and let the engine run to maintain speed. It vibrates a little more when acceleration, but I do feel it when I let the engine brake too. No Vibes on coast at speed eliminates the driveshaft as the culprit as unbalanced. It eliminates tries too. Good. If it only happens when the engine is stressing the trans either excel or decel, I would begin with double checking that the mating bolts between the engine and trans are torqued tight. Loosened bolts will allow the trans to move with the torque of the clutch and vibrate but will not vibrate while coasting. It's an easy thing to overlook while doing a complete swap or you could have tightened them before the trans was fully seated on the guidepins and it shifted and settled after running a bit and now they are loose. After checking the trans to TC bolts as suggested I might look to the rear slip yoke. In order for the slip yoke to work the splines cannot bind. The OD of the yoke is supported by a bushing inside the extension housing while the inside of the yoke is supported by the output shaft splines. As the yoke is extended farther out of the TC the ability of the bushing and splines to work together to support the yoke decreases. This can cause the yoke to bind as torque from acceleration or deceleration causes the axle to rotate on the spring. If this is happening you can sometimes relieve the binding by using an EP lube on the output shaft splines. This is not usually a permanent solution as the TC fluid will eventually wash out the EP lube. 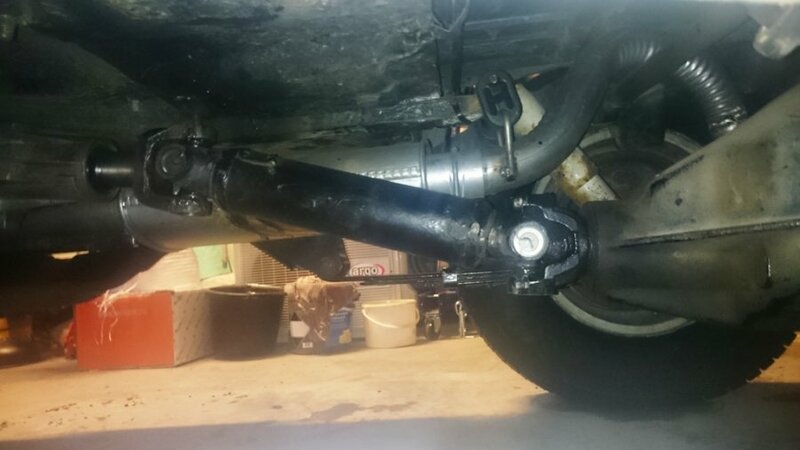 The better solution is to lengthen the driveshaft or possibly to find a longer yoke.